This very precious Angel was found in a dog’s mouth and turned into animal control in Ca. It is unknown how he came to be outside wandering on his own. The best guess is possibly his owner had passed away and somehow he got outside looking for people to help him. He spent 20 days in a vet’s office there and that is where they gave him the name of “Taylor”. 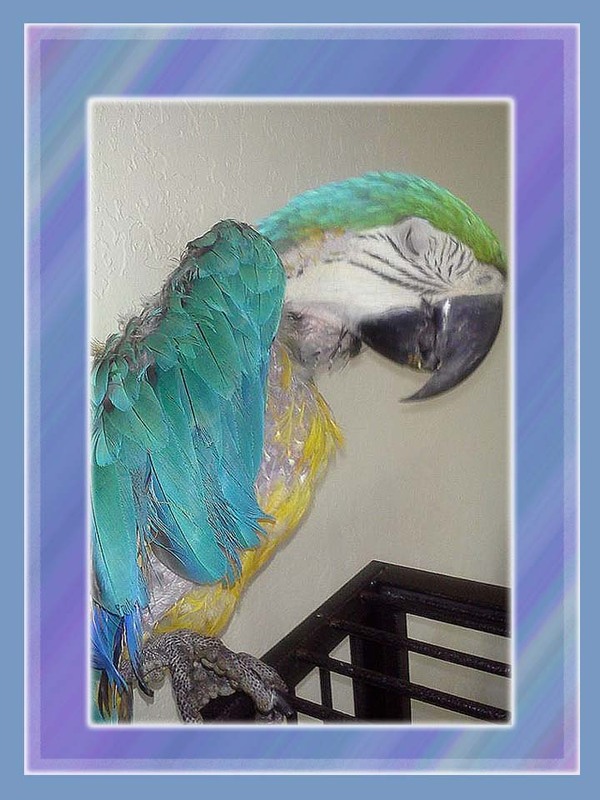 Someone who had worked with Best Friends Parrot Garden heard about him being at the vets office and since nobody came forward to claim him they contacted Jacqueline Johnson the manager for Best Friends Parrot Garden. Jacqueline said that they were already at full capacity, but after hearing his story she knew that this very special boy needed someone with experience to give him everything he deserved at this time in his life. Jacqueline contacted Bonnie Grafton, one of the very experienced employees at Best Friends and told her about Taylor. Bonnie was home in bed with Type A flu, but she agreed immediately to meet the transport person and bring Taylor to her home for ISO. The moment Bonnie saw him she was astounded by his apparent age, she said he is the oldest bird she had ever seen and even his nares are wrinkled. His wings are fused, he is a little feathered challenged and he is dealing with tumors of some sort. 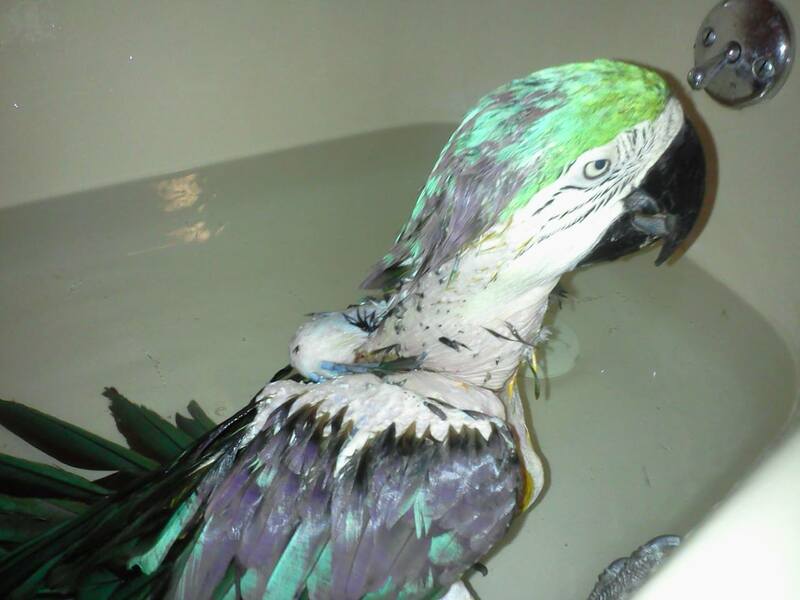 In all her years of dealing with avian rescue, she said she had never seen a bird in this kind of condition. He stepped up immediately for Bonnie and she knew in that moment that he was one special Angel. She vowed right there to make sure the rest of his life is full of good things. Taylor is now spending his life with Bonnie and Ed Grafton. They have fallen in love with this precious soul and said it is very apparent that he was at one time someone’s beloved companion. The Grafton’s say he is a very special old guy and for whatever time he has left, he will be staying with them. They believe he especially deserves the comfort of a home and are glad to have him. ” He stole our hearts the moment we met him. He is home now, and here he will spend the rest of his days”. His first night with Bonnie and Ed, they mixed chop with his pellets and he dug through and picked up 2 pellets in his beak, went to the water dish and dunked them and started eating. Obviously he knew what pellets were and had been given a good diet previously. When he sees them he says “Wanna come out”. It is so very obvious that this boy has been loved and has shared his life with those that he loved as well. 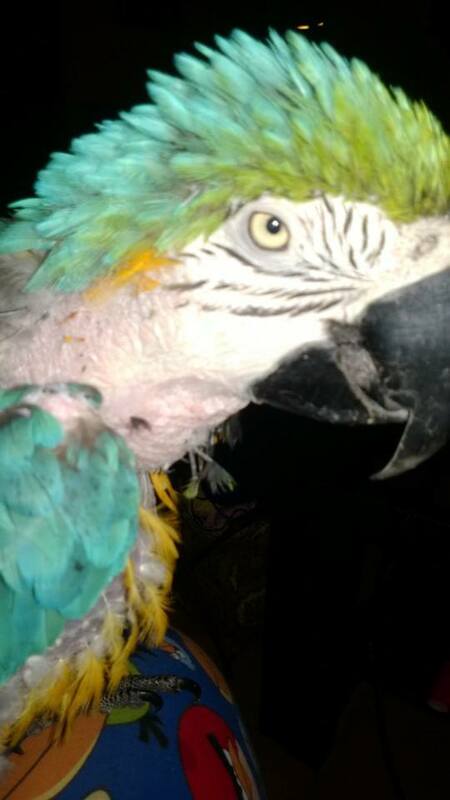 Taylor has a new vet and even she commented that he was indeed the nicest Macaw she had ever met. Taylor has some injuries that are being taken care of by Bonnie, and also has tumors that the vet will be dealing with. For now Bonnie has been bathing him daily and treating the wounds. He very patiently allows her to do this, however Bonnie says he is a true Mac and has expressed his displeasure with some of the treatments, but he quickly settles back down and allows her to take care of him. His medical treatments are done twice a day and he is also has to take oral medications. While he isn’t happy about all of this, he complies and is rewarded with a big walnut afterwards and as with ALL Macaws…food is always a motivator. Bonnie also says he is one of the most loving macaws she ever met, he gently lays his sweet head in their hands and will snuggle against their chest for love right after his medical treatments. Bonnie and Ed have also started lovingly calling him “Walter” or “Gramps”. They are hoping that someday he will tell them what his name is but for now he is just an Angel no matter what his name was. So what do we know about “Taylor”… well we know he a very old soul. This is obvious by the wrinkles of time on his body. In captivity this means he was loved and cared for to make it this far in life. How did he get out on his own? We may never know that unless someone comes forward someday to share his story. Until that time we can only speculate on how it could have happened. It is very clear that this boy was very loved and cared for during his many years here on this earth. He shows this in his own ability to love and trust others so immediately. When these Angels are coming from abusive lives they do not respond with such trust so quickly. So while we may never know how he got loose…we do know that his journey has now taken him to the loving home of Bonnie and Ed Grafton and for however long his life may be, he will be spending it with two people who also truly love him. He is one special and loved boy and his life should be a celebrated! When the Lord calls him to the Rainbow Bridge one day, what a story he will have to share with all the other birds and animals there. He has had quite a journey….full of Love…and isn’t that what life is all about? For those of you following “Taylor”…Every few days Taylor needs to get into a nice warm bath. The warm water seems to help with a little lift in his wings and we can get things really clean and wash away the buildup from his wound care. However, in true mac fashion he has already figured out when we have an agenda. He will lay his head on my arm and completely refuse to step up. Anyway, everyone loves a cute bath picture, so here you go! 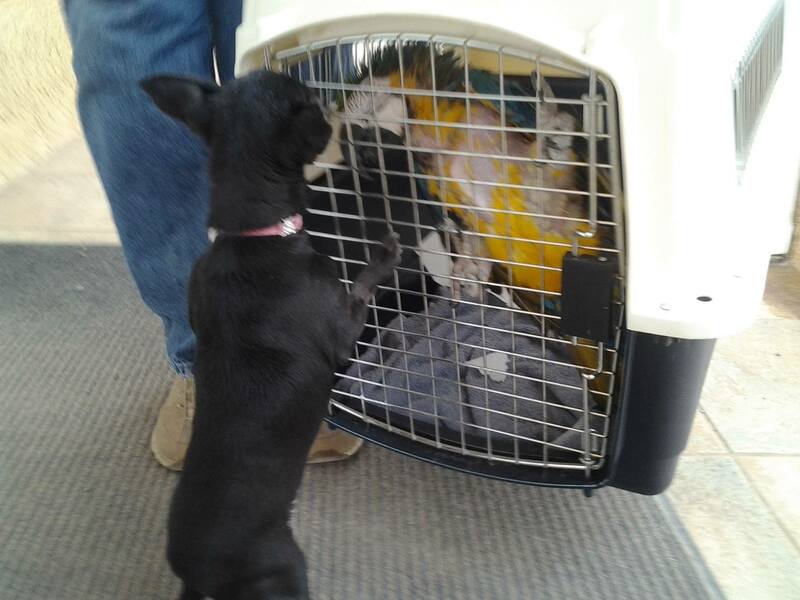 Pearl the chihuahua was the official greeter at the clinic today. Pearl is a puppy mill mom who spent 13 years in a cage producing babies. She was outside today because she is learning to run. I’ll let you think about that for a minute. Pearl was fascinated with Taylor, as was he with her. Cutest interaction ever. This lasted only a few moments and was closely supervised by myself and Pearl’s mom, Kim. Neither animal was ever in any danger, each only curious about the other. Now…on to Taylor’s update..The doctor continues to be pleased with Taylor’s progress and we got the go ahead to use honey to help the healing process. Our doctor is concentrating on Taylor’s wound and general improving health before addressing exactly how she is going to get the blood draw. So, Taylor’s quarantine will continue in our home and he will go back to the doc in a couple weeks. He was a little upset after his wound cleaning today and stood for several minutes just holding my finger in his talon. He continues to offer his head to everyone he meets, including Pearl. I will continue to wonder about the person who loved him so much before us and hope that where ever they are, they know that he is once again safe and loved. All this time, we were thinking Taylor was saying “Hi Paco”. Tonight, Ed finally got it. Taylor’s real name was Popeye. When Ed said it to him, he answered with “What?” not once but twice. If you sing “Popeye the Sailor Man”, he whistles twice at the end…..too funny! Pissed off Popeye. 3 months in and we are still fighting this horrific wound.Yesterday the entire wound area was debrided under anesthesia and bandaged. All I’ve got to say about that is this is one tough old bird with a will to live that blows me away. When we got home, Popeye ate like we’d been starving him and then immediately started on the bandages. 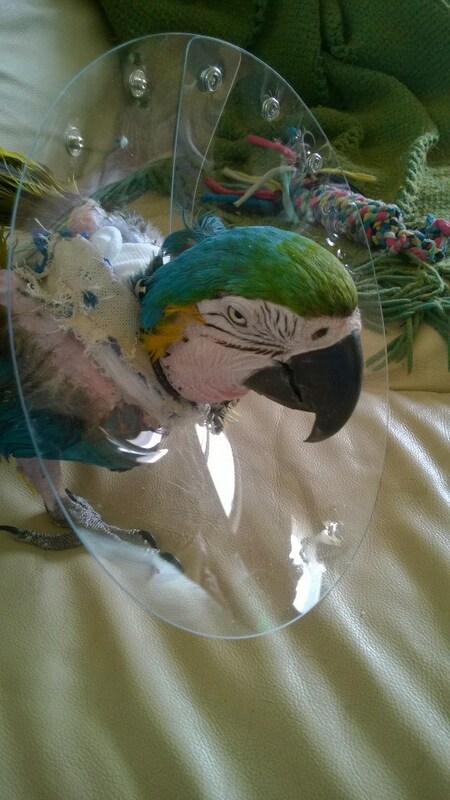 No soft collar available, so we had to go with the cone of shame until Friday. When he figured out he couldn’t reach the offense material with his beak he started pulling the bandages with his feet…more adjustments, more tape. It’s been a long night of dish throwing, towel chewing and collar snapping. I’d love to hear what Bonnie & Ed are taught from this wise one. What a blessing to all three of them. Thank you for loving him, Bonnie and Ed. He deserves all that you can give. Thank you from the bottom of my heart for loving him. Such a wonderful saga, God Bless you Taylor, Bonnie and Ed. Please keep us posted on all the great things Taylor shares with you. He couldn’t have landed in a better home! May you all have many good days of love, life and Joy ahead. 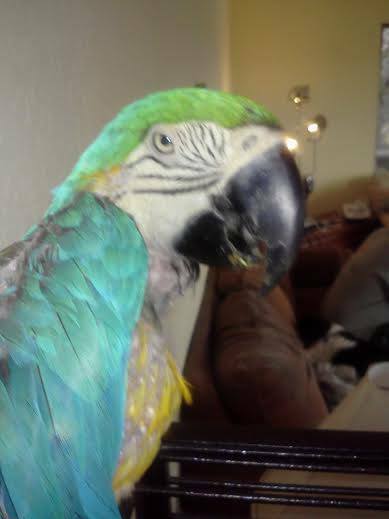 Amazing story…thanks for sharing this story with everyone,my blue and gold is only 13 years oldand i cant imagine my life without him..i have had him since he was 2 weeks old..God bless you and your husband for giving him a home.. Thanks Bonnie and Ed for taking this old soul into your hearts and home.. I’m sure he will reward you with love in kind…. Thank you all for your kind comments. I’m a little embarrassed by all the attention because I know that each of you would have done the same thing. “Taylor” is one very special old guy and we feel very lucky that he has joined our family. I absolutely loved this story. How wonderful and precious! My husband and I have two rescue birds- an african grey and a cockatoo. We hope to someday rescue a macaw and an amazon as well. I especially loved the quote at the end about parrots being children from another world. How true! Beautiful story. 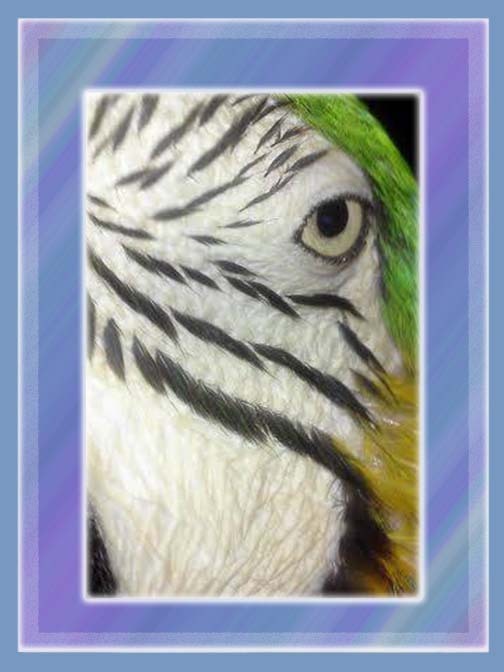 I have 21 parrots and can only pray that when I am gone someone will love them as much as I do> God Bless. I was deeply touched by this story of true redemption for this very special boy. The fact that he is now in the care of Bonnie & Ed is a true miracle. When I met Bonnie, I immediately sensed her devotion for our fine feathered friends! 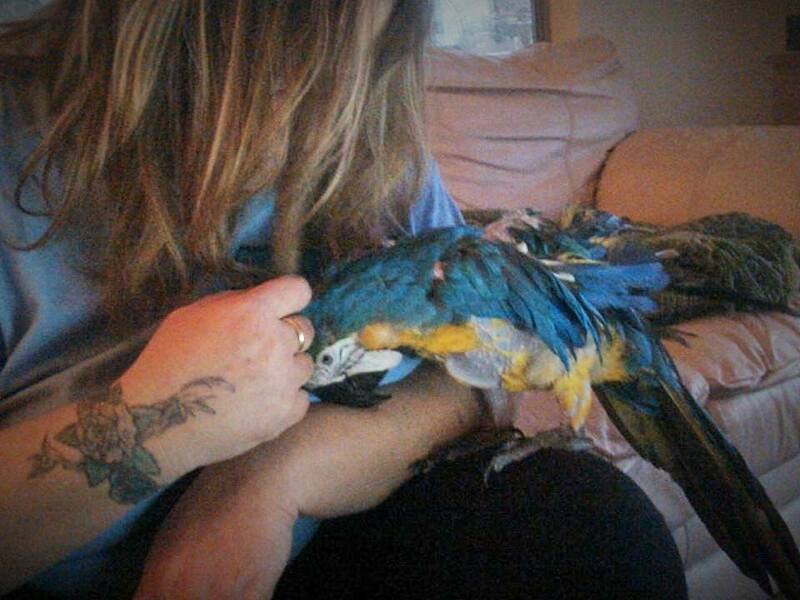 It brings me much joy to know she was the one to care for this very needy Macaw. Now Walter is home nestled in their love & care & that alone brings comfort to me. So nice to hear from you. Much love to your family & Dizzy! Good! Blessings on you, Ed & Bonnie! Your story made me cry! You all are so very lucky to have found him….treasure every single moment with him as each is precious! I also had the wonderful priviledge to have had time with a rescue bird. I took in Mac, a Timneh that I had an immediate connection with. She was crippled and picked – being bare-chested when I got her. She too, was so trusting and sweet. During her time with me she grew her feathers back (the ones she could), learned to play with toys and enjoy a bigger cage with lots of perches and a playtop. I only had her for 8 mos before she passed but she was like a child to me and we had a bond closer than any I have ever had with another bird. Without going into her history, she had obviously had a long, rough life. It was clear that the time we had together was probably the best 8 months of her life and I will always treasure those memories. You are special people who are so lucky to have this opportunity — I wish you many years of happy, loving companionship with Taylor. Thank you all for continuing to follow Taylor’s journey! I’m so glad you found each other Bonnie. Special needs pets, like special needs kids, can definitely be heart wrenching. It seems he does realize your ministrations are to help him since once the pain subsides he comes to share affection. You are all on a journey full of love, sprinkled with challenges of course, but life is rarely easy. Blessings to you all, you’ve earned them. Thank you for being his angel on earth and giving him the love and care he deserves. Thank you so much for taking Popeye into your home and heart. And sharing his story with use. 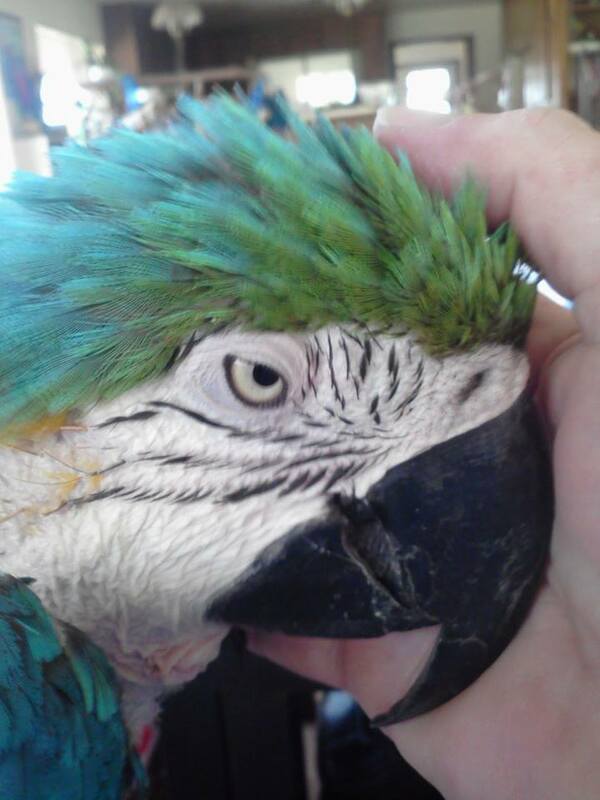 I do macaw rescue as well. While I have seen many sad cases, Popeye’s story is special! Keep up the great work! Can’t stop crying! Good luck to you and the wonderful bird! Thank you for sharing your story of magnificent Popeye The Taylor Man. I was smiling and crying reading this incredible story . I really enjoyed the pictures and the song selection is perfect ! Please keep up all your fantastic work and love you provide all the birds ! What a wonderful world indeed ! He is such a lovely and sweet boy. Bless you Popeyes, and your new forever family! Inspirational bird and story! No matter what- he knows he is loved and safe!! !